This week on 11/12 June, AMEC is holding their next International Summit on Measurement. Many of you will recognize AMEC as the framer of the Barcelona Principles at their annual meeting in 2010. The theme this year is upping the game to deliver relevant insights along with traditional measurement reporting on performance against objectives and KPIs, in order to provide a richer environment and context for making strategic business decisions. In this post, I wanted to shine the light on a workshop during the Summit called, Metrics that matter: Making sense of social media measurement. The session, led by Richard Bagnall, promises to look at the latest social media measurement trends, provide a look ahead at what might be right around the corner in the next 12 months, and unveil a revised and enhanced AMEC social media measurement framework guide that should make it easier to implement the frameworks in your own planning environments. At last year’s Summit in Madrid, we presented the initial work in developing models and frameworks to support rigorous and valid social media measurement. It consisted primarily of three elements – a new model for social media measurement, a couple of alternatives ways to think about populating the model with relevant metrics, and a social media measurement planning framework/template. 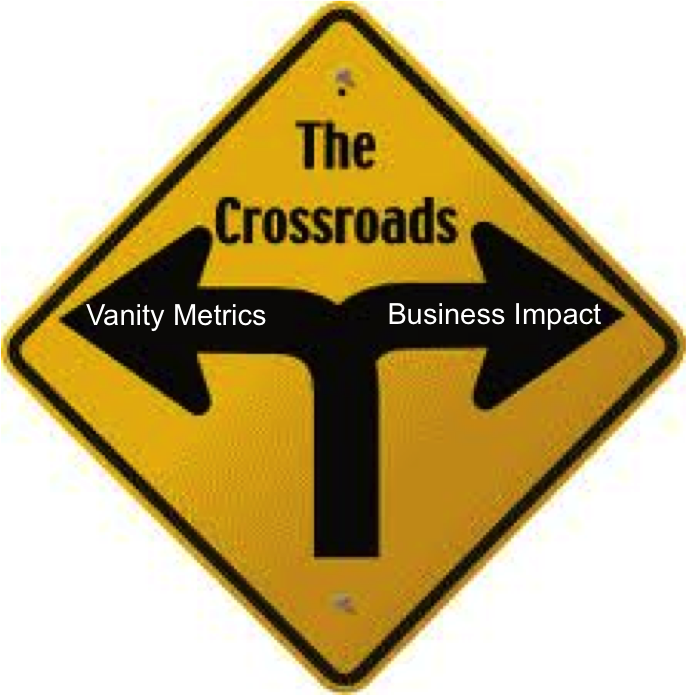 The initial metrics approaches focused on two alternatives, metrics focused across programmatic, channel and business dimensions as well as an approach based on the Paid, Earned, Shared and Owned integrated channel metrics approach which enjoys traction in many organizations. Based on using and customizing the approach for multiple clients, here are a few things to consider as you review and think about using the new frameworks and usage guidance to be unveiled this week. As campaigns become increasingly integrated across media types it makes sense to also reflect this integrated view in measurement. Ideally, measurement should reflect a similar level of integration as the campaign or program being measured. As we measure performance from the four channels, we should keep in mind what we really would like to understand is how the channel efforts amplify or build on each other. The work presented at last year’s Summit showed example or illustrative metrics for each of the media types across the measurement model. Expect this year’s version to take a stronger view of the most relevant or best metrics to use when employing this approach. Another key development would be the presentation of different metrics models to use with the measurement model. The intention all along was there could be a range of choices to fit different corporate cultures and planning environments. 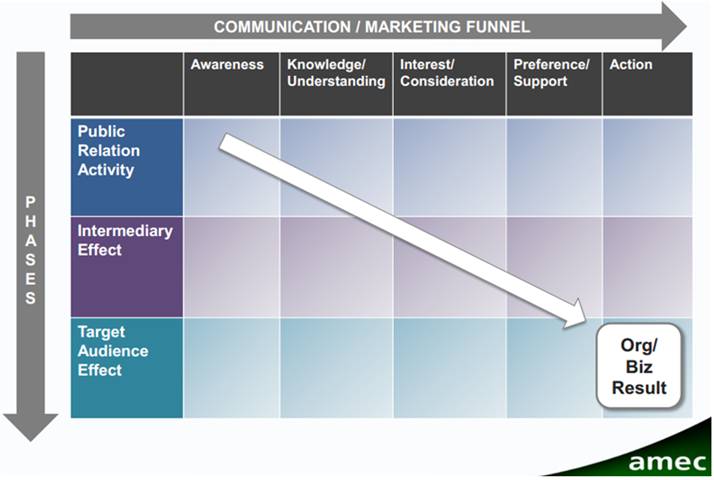 The measurement planning template is the heart of your social media measurement planning effort. It is best used by conducting a facilitated discussion with all measurement stakeholders around each of the key elements in the planning template. Setting aside half-a-day to complete the exercise is not excessive. Here is how we think about using the template in our social media measurement planning. Business or Organizational Objectives: The agreed upon overarching organizational objective(s) the social media effort is designed to impact. These objectives may be given to the social media team or they may be the result of conversations and negotiations. KPIs (Key Performance Indicators): One or two high-level metrics that are aligned with the business/organizational objectives and are outcome-oriented. Again, the KPIs may be given to the measurement team or the measurement team can help guide the conversation to develop them. Program Elements: Outline the major elements of the program. The elements should reflect the scope and integration of the campaign. They could range from a simple social media program to one that includes social media, online advertising, influencer outreach, e-mail marketing and other elements. 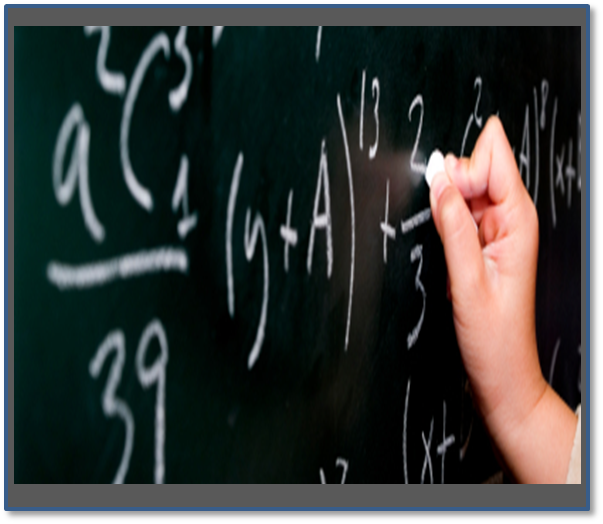 Program Objectives: Capture or write the measurable objective associated with each major aspect of the program above. Frequently you will need to help rewrite the metrics to make them measurable. You may also need to rewrite them to actually make them objectives (what) and not strategies (how). Measurement Story: This is an attempt to marry the concepts of measurement and story telling. At the end of the program, what measurement story would you like to be able to tell your key stakeholders? This should be based on accomplishing your specific KPIs through the success of the programs used and your ability to prove that through data and measurement. We typically develop the measurement story right after settling on the business objectives and KPIs, and use it as a guidepost to ensure we have the means and methods to tell the desired story. Key Metrics: The metrics directly tied to program objectives. Should be aligned with the objectives as well as the higher order KPIs. The most important KPIs and metrics and often captured on a dashboard for monitoring and/or reporting. 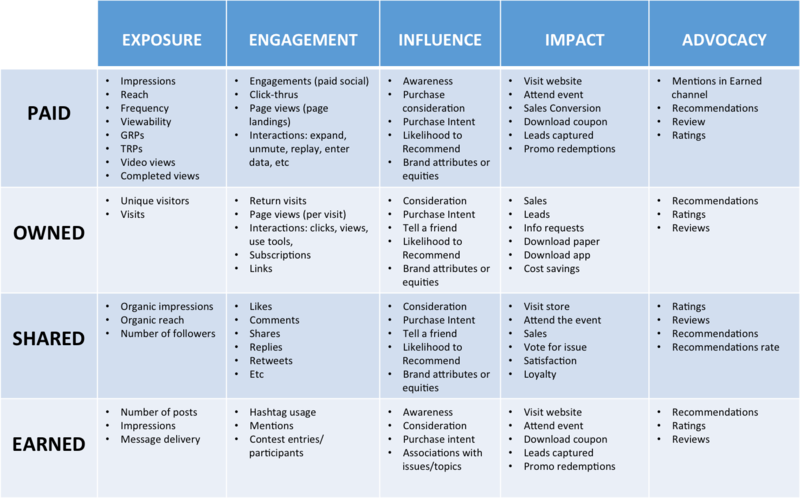 Place metrics in their respective place in the measurement model (Exposure/Engagement/Influence/Impact/Advocacy) Metrics that appear toward the right side of the model are generally more compelling than those addressing just Exposure or Engagement. These generally get to the outcomes rather than just outputs of program activities. Examine how closely aligned each metric is with program objectives. Metrics that directly support the objective are generally more important than those that indirectly support the objective. Look at the degree to which the metric is explicitly part of the Measurement Story. Metrics directly aligned with the Measurement Story represent better potential dashboard metrics than those that are tangential to the story. Metrics that provide context are generally stronger than those that don’t. For example, RTs per 1000 Followers tells you much more than just the Number of RTs – it gives an indication of community engagement. Likewise, Engagement Rate (Number of Engagements divided by Total Reach) is a better metric that just the Number of Engagements. Remember the audience – at the end of the day, when you’re showing your stakeholders what you accomplished this year, what would they be most excited to hear? What will they want to see that ultimately demonstrates the best use of their dollars? After the Summit I’ll post a reaction to Professor Jim Macnamara’s unveiling of his new his new paradigm and model for measurement and evaluation. Jim is incredibly smart and thoughtful so I’ll be curious to see and discuss what he proposes. Enjoy the Summit in person or through social media and contribute to the dialogue. I would like to acknowledge our colleagues at R/GA for their contributions to the thinking you see here.